Little River Casino Prize for one lucky jumper! The Ludington Splash Pad has received over $7000 in business sponsors for the 20th annual Ludington Lake Jump so far. The Little River Casino and Resort in Manistee is one of those generous sponsors. 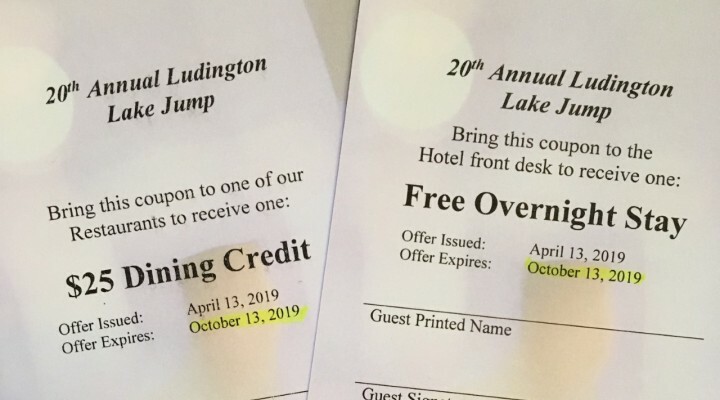 Any jumper who comes to the lake jump event with $50 or more donations in hand will be entered into a drawing to win a free night stay voucher and a $25 food voucher for the Little River Casino! The jumper must be 21 or over to be eligible. Not 21? Don’t worry, we will have a prize drawing for you too….stay tuned!! Want to be a jumper? It’s easy! Click the link to download the pledge sheet, and start raising money! Then come to Stearns Beach on April 13th between 9:45-10:45am to register. The jump is at 11! See you on the beach!!! This entry was posted in Main Page Articles. Bookmark the permalink. Copyright © 2019 Lake Jump - Lake Jump Fundraising Event for the Ludington Splash Pad.